Geraldina Interiano Wise discovered art at a young age in her native El Salvador. A graduate from Rice University in Architecture/Art/Art History, she is now a dedicated artist, in the realm of Abstract Expressionism with a source. Her artist’s voice comes deep from the intellectual patrimony of her Maya ancestry, rooted in the fast changing cultural, social, physical and scientific environment of Houston and the US. The origins of humans and what unites them is a continuing theme in her abstract dynamic vocabulary of art. The overarching theme of coexistence and connectivity is a constant in her work across different mediums, which is the genesis of the Horizontelive painting performance collaboration with Musiqa. Geraldina works at her studio in the Washington Arts District, has taken classes at Glassell School of Art, and is a permanent visiting student in Printmaking at Rice University, under the tutelage of Professor Karin Broker. Horizonte came about from a shared value of decoding the arts, and breaking down the barriers of understanding contemporary art and music. Inspired by the Timed Painting performance art by Texan Robert Rauschemberg in the 60’s, and by the groundbreaking choreography by Trisha Brown in Set and Reset. Fast-forward five decades, accessibility and inclusion in art aren’t just socio-political lingo: they are values that should be considered by all. The goal of Horizonte is to open doors for others, and to break down views of divisiveness prevalent in society. Art is a common language in human DNA; it unites. 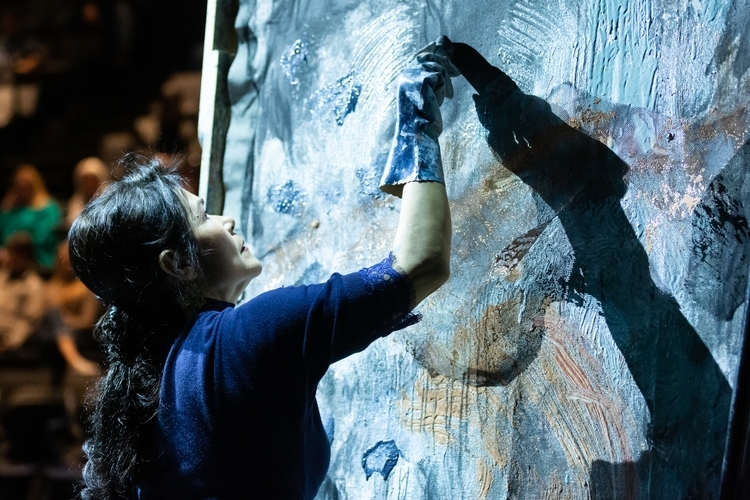 The live painting performance aims to make vivid memories of strong, immediate but hopeful music by NYC contemporary composer Annie Gosfiels, that sets the stage for Geraldina to express the numerical codes of the Maya. Using house paints the colors of the ancient pigments used by man to express their view since the cave paintings at Boblos, indigo pigment sourced from ancient seed in El Salvador, applied with household cleaning tools as an ode to her fellow Latino working people, she paints a story of understanding for all mankind.